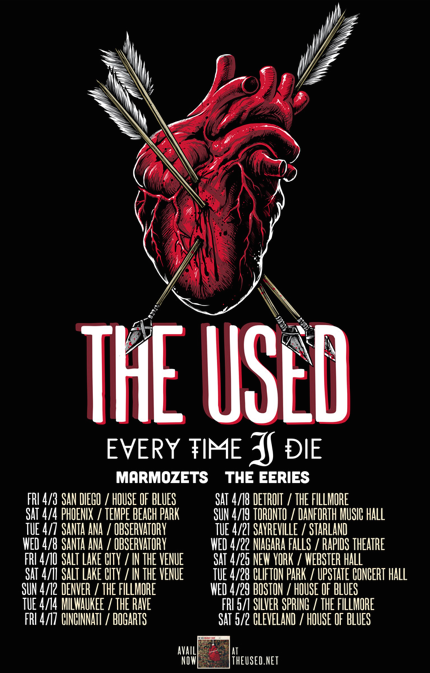 The Used has announced a North American Spring tour with Every Time I Die, The Marmozets, and The Eeries. The tour kicks off on April 3rd in San Diego, CA and wraps on May 2nd in Cleveland, OH. Presale tickets will be available today at 2PM local time through Thursday, January 29th at 10PM local time, HERE. General tickets will be available on Friday, January 30th at 10AM local time. The Used will be touring in support of their newest album, Imaginary Enemy, which was released just last year. 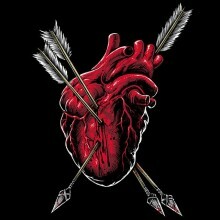 The album, which hit #1 on the Billboard Independent Chart, is available on iTunes HERE. For more information, please visit The Used’s website. The band then released the CD/DVD combo Maybe Memories in 2003, now certified platinum, featuring B-sides, live cuts, demos and unreleased tracks, while still another gold record followed-2004’s In Love And Death-spawning singles “Take It Away,” “I Caught Fire” and “All That I’ve Got” – which earned the band their first MuchMusic Video Award nomination. Their latest LP Imaginary Enemy put the band’s political frustrations and commitment to social change at its forefront and has opened up the platform for conversation among fans and critics alike. The album climbed high on the Independent, Tastemaker Albums, Hard Rock, Alternative, Digital Albums and Top Rock charts.